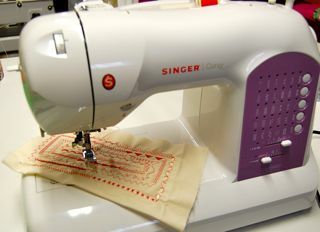 Whether you have a new circular stitcher, like I have for the Singer Curvy and the Circular Embroidery Attachment #83 for the BERNINA 450, or if you have a vintage circular stitcher - try some lovely reverse applique. 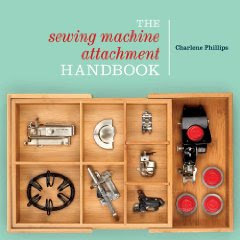 Do you have a flower stitch attachment? Try the same with it! Quite easy to do. After the first one, you will be addicted! Have fun! To practice grab 2 pieces of cotton about 6 x 6 inches in several colors/designs. Also need a 3 x 3 scrap for the applique heart. You will stabilize with a light tear away and cut it 6 x 6 inches. Cut the heart from the 3 x 3 inch fabric. Mark a point on the top layer for the center of the reverse applique circle. 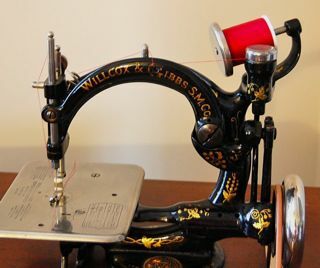 Attach the circular stitcher to the machine. Remove the cap from the pin, and place the layered fabric over the pin. Be sure to put that cap back on the pin! Check the size of your circle by turning the fabric around the pin. If you need to adjust the size, refer to your attachment instructions. All styles have an adjustment knob. First attach a zigzag foot or Clear Foot #34/34C to the machine. Select the straight stitch. Begin sewing, letting the fabric turn around the pin. 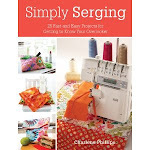 Instead of back tacking, overlap the beginning and ending stitches (keeps the bulk down). Remove the fabric. Don't move the pin at all. 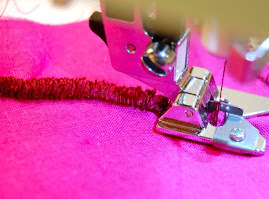 With your sharp scissors (I use applique scissors), trim away the top fabric layer from within the circle. Trim close but not the stitching. Place back on the pin - matching the initial pin hole. Select your satin stitch (this is usually a zigzag of 0.3mm stitch length). Attach an open toe embroidery foot (or you can continue using the zigzag/satin stitch foot). Stitch around the circle. You are now covering the first straight stitch and the raw edges. Overlap the stitching at the ends. Pull threads to the back. For a nice decorative stitch, either inside the circle or right outside - adjust the circular stitcher to where you want the next stitching. I moved mine to fall inside the satin stitching. 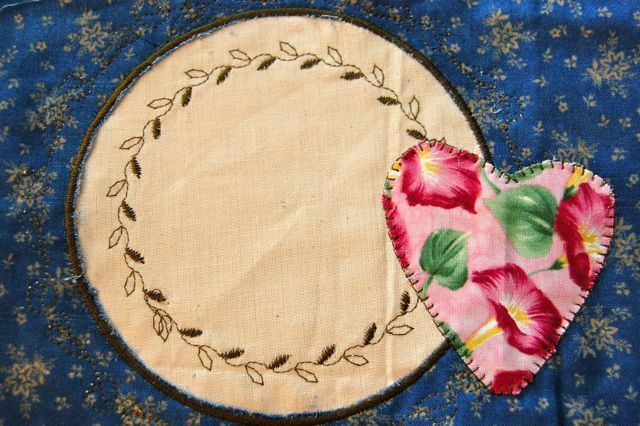 Choose a nice decorative stitch and sew around the circle. Now you can remove the circular stitch attachment. The last stitch is a blanket stitch for the appliqued heart. Select the blanket stitch (or you may have a nice pin stitch). Spray your heart with a spray adhesive. This makes an easier task, rather than pinning. The applique won't move on you and stay right where you want it. Place on your layered fabric. Use cotton thread in the needle and monofilament in the bobbin. Attach the open toe or zigzag foot. I adjusted the width of my blanket stitch to 3mm. If you need better placement of the stitching, move your needle position (instead of moving the fabric). If you have needle position always use when you can for better stitching). Stitch around the heart. Keep the straight part of the blanket stitch on the raw edge and the points stitching into the applique. Sew slowly around the corners. Voila! A lovely reverse applique. 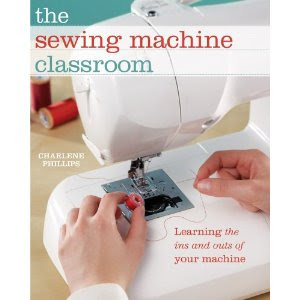 Thanks for all your great instructions Charlene - I stumbled across your blog when I was looking for some instructions on ruffler attachments - I've learned a lot by browsing through most your posts. 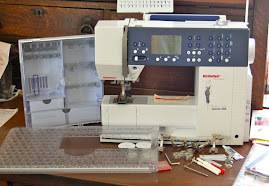 I am really looking forward to any info that you post particularly on bernina attachments as I have recently acquired an elderly 830 with a bunch of feet and attachments. You are so lucky Elaine to have the 830, and especially with a nice amount of feet and attachments. I will continue to share more of the BERNINA feet and hope you enjoy. Thank you for such lovely compliments.